With so many different bar exam preparation programs available today, it can become difficult, not to mention overwhelming, to choose the best one for you. After all, a simple Google search for ‘bar exam prep’ generates nearly half a million different results. However, AdaptiBar is never the wrong choice when it comes to studying for the MBE, as it undoubtedly provides you with the tools you need to pass. Not quite convinced yet? 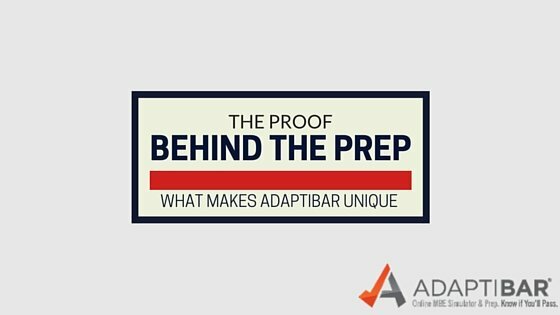 Just keep reading to find out what makes AdaptiBar the best MBE bar prep program on the market. Proof #1: AdaptiBar was created by a law student for the law student. To truly understand the uniqueness of AdaptiBar, you must first understand the uniqueness of how it was created. In 2003, law student Tarek Fadel, now AdaptiBar’s founder and CEO, was studying for the bar exam. But when it came time to study for the MBE, he knew there had to be a better way. So he created it. Not only did he drop out of the approaching exam to make his vision a reality, but Fadel dedicated the following two years to developing a more effective and advanced MBE prep program. He sought to provide law students with the best study experience at the best price, a purpose which continues to thrive within the company today. In 2005, Fadel used his specialized program, AdaptiBar, to pass the bar exam on the first try. Thus, AdaptiBar was created by a law student – not a professor, a self-proclaimed MBE expert, or an attorney who took the bar exam years ago – to fit the needs of every future bar examinee. After all, who better to understand and develop a program for law students than an actual student preparing to take the bar exam? AdaptiBar provides you with relevant tools that will effectively target and fulfill all your MBE study needs, making it unique from other prep programs. Proof #2: Its advanced technology is patented, meaning you won’t find anything else like it. AdaptiBar is well-known for its technology that allows upcoming bar examinees to customize their learning, target their weaknesses, and track their timing and subject performance. Want to answer questions about a particular subtopic, such as individual rights? Would you benefit from taking a practice exam only on Constitutional Law and Torts? Or, do you want to learn about the newly added MBE topic, Civil Procedure? All of these can be achieved through AdaptiBar, as you are able to specify which topics and subtopics you would like to cover. You can also choose between answering practice questions in Practice Questions Mode and simulating real exam conditions in Practice Exams Mode. As you answer questions in Practice Questions Mode, the program’s technology automatically adjusts the presentation of the questions to you according to your weaknesses, while still refining your strengths. You can see a visual representation of your specific strengths and weaknesses by looking under the ‘subject performance’ and ‘subject analysis’ tabs. You can also determine your “sweet spot”, or time at which you answer questions with the greatest accuracy, utilizing the ‘timing performance’ and ‘timing analysis’ tabs. Not only does AdaptiBar’s adaptive technology simplify your studying, but it provides you with the most efficient method of prepping for the MBE possible. And, because it’s patented, you won’t find anything like it anywhere else on the market. Proof #3: AdaptiBar is PROVEN to predict your MBE score. Know if you’ll pass. AdaptiBar stands by its slogan 100%, as the program’s advanced technology has been proven to accurately predict your MBE score. For example, if you are getting a 60% in the AdaptiBar program, you are proven to score around a 120 RAW score on the MBE. By utilizing this technology, you can feel confident knowing exactly where you stand and reduce your stress level before the bar exam. Proof #4: Every question released by the NCBE is available to you WITH explanations. It’s no secret that you can buy practice exams off of the NCBE website. But, when you purchase an exam in this way, you are forced to figure out why an answer is correct or incorrect on your own. This means that if you can’t determine why multiple choice letter C is wrong and A is right, you have no other option but to spend hours looking for the answer in your piles of textbooks and bar prep materials. Why study this way and waste valuable time when AdaptiBar comes with detailed explanations of not only why an answer choice is correct, but why the others are incorrect? All explanations were written by law professionals and legal experts. Plus, you’ll have access to the entire database of licensed NCBE questions in addition to 200 simulated questions on Civil Procedure – that’s a total of 1,730 questions and explanations! More than 89% of American adults ages 18-29 own a smartphone, while 83% have a computer and 43% use a tablet. This means that nearly anyone can start studying with AdaptiBar right now. The program is easily accessible from all electronic devices with an internet connection and allows you to study both sitting and on-the-go. So whether you’re waiting in line at the grocery store, taking the train to work, or prepping at the library, you will always have instant access to all of AdaptiBar’s unique features! Interested in experiencing AdaptiBar’s key features for yourself? Get a free trial here!